The Chronicles of Pendragon Hold: Witches, Witches EVERYWHERE! It's a cloudy, rainy Sunday afternoon and everything is topsy-turvy here at the Hold. THE Wife decided that now that the guest room belongs to the resident offspring, we need to rearrange the extra room, currently her workshop, into a guest room/sorta workshop. So we huffed and we puffed and we moved furniture around, hauled the treadmill out into the living room (where maybe we will start USING the damn thing for once) and made space for an inflatable queen sized bed, which we will acquire in a few paychecks. THIS paycheck has been supporting the finally completed terrace garden, which is now fully topped off with good soil and covered with weed block fabric. We made the rounds of the ace hardware store and home depot and bought up some tomato and other veggie plants and herbs, as well as seeds for squash, sunflowers, and beans. I'll have to shred some more leaves, which I have no shortage of, for mulch to put over the fabric, and then it's us versus the bugs, which I hope we can control this year. So far it seems we are going to have plenty of rain to quench the thirst of our garden. AAAAAAND, we met a kindred soul while at the Ace hardware store. A young lady approaches me and tells me, " I really, really, REALLY like your pendent..."
If I had been ANYthing but Wiccan and very married, I would have thought I was being hit on......grin. However, there's one thing about Wiccan Pentacles, our version of the crucifix; it's a Witch magnet! It's the one "secret" symbol that pagans share and allows us to pick each other out amongst this sea of God-fearing peoples. Note I said God "FEARING". We pagans don't fear our deities. Anyway, she and the wife show each other their tattoos and make some introductory small talk and trade email addresses and phone numbers and go our merry ways. That's how we discover each other. Meantime, THE Wife and her long-lost girlfriend are communing by email and phone and when THESE two broads get together they are going to reach critical mass and it's going to be a RIOT! I already feel kindred with her husband and I don't even know the guy....hehe. The evil twin decided to spend the weekend with the good twin down St Petersburg way. So, I've had a couple of nights of freedom to walk around the abode with everything hanging out. She'll be home tonight so so much for that....lol. Actually, we will be very happy to have her home. Our good friend (and my co-worker) Eddy has now headed out to a month at some Army base somewhere before heading to Iraq for a year or more. I am so hoping the Goddess takes good care of this boy as we have asked. I think overall, the world would be better served with him in it, AND in one piece. Speaking of birds flocking together......we came across a Jacksonville Pagan group that meets for fellowship every month as advertised on a website that promotes "meet-ups", and thought perhaps we would attend a meeting, but no sooner did we sign up then we get this letter, loaded with drama and emotion concerning some other ex-member who was purported to be mentally imbalanced and out to steal members from this group and.....whaoooo....WAY to much drama for us! On top of that, some "elder" or authority figure of some sort puts out another letter stating that she/he (I can't remember which) has returned to resume control of the group and aside from some "inclusive" language, warns of dire magical consequences if anyone dares cause harm to anyone in the group. DRAMA! Look, as far as I'm concerned, paganism has a hard enough time being taken seriously in this world of religious insanity, so these "witch-wars" and other juvenile behaviors belong on elementary school playgrounds and not in the serious realm of spirituality. If someone wishes me harm, I deal with them the old-fashioned way; according to the rule of law, i.e. lawsuits or criminal prosecution. We have been blessed with a pretty good secular rule of law and we should use it for just that purpose. As far as "hexes" and other such nonsense, these practices have no place in Wicca, and I am personally inclined not to give such behaviors enough credence to be effected by them. All that Voodoo has no effect on someone who values logic over superstition. The universe has enough natural evil, we have no business encouraging it. As I am writing this, the evil twin has returned to the nest. Just in time for dinner, too! Go figure! lol Good to have her back. 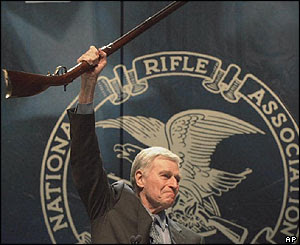 Oh, and in case anybody is interested, you can now pull Charleton Heston's gun from his cold, dead fingers. Farewell, Moses, we will all miss you! Look, guys, I'd love to chew the fat with you all, but I have to work tomorrow, so I'm gonna close this now and get it posted so that you have something to digest. Merry Meet, Merry Part, and Merry Posts again! This entry was posted on Sunday, April 6, 2008 at Sunday, April 06, 2008 . You can follow any responses to this entry through the comments feed . Seems like there is a whole lot of drama going on most everywhere. Life is too short for that crap. I liked Heston. He was a good actor. His role in El Cid is probably my favorite. Why do you call her the Evil Twin? That would be WAY too much drama for me too. Jeez, are there any grownups around here? I just don't DO drama, especially in groups. Grow up for goodness sake. I noticed you were getting a bunch of rain. Last week, Thursday/Friday, we logged 4.6" of rain in the gauge. That's a bunch. My peppers and tomatoes LOVED it. As did I, since I didn't have to water then. Your garden looks good. We're thinking of expanding ours. We have the plot all dug, need to turn in more compost and decide what to plant now. We're trying to plant things we usually eat this time, so it would be squash, green beans, but not sure what else. Sounds like things are going well. But I will surely not miss Heston. Ugh. Hey You..lots of interesting news. I like these insider thingamabobs. That terrace is awesome..I love playing in the dirt and building bite sized projects like that. I saw my first Robin the other day so Spring may actually be here..the snow is almost gone in my backyard and the Raccoons are back. This was a long cold Winter and I am not going to complain about the heat this Summer ..until August..promise. Mr bare/bear arms is on TV playing Ben Hur... that irresistable title must have been parodied in some weird Transexual movie somewhere in the Siliporn Valley.